Absolutely stunning earrings, with a dazzle factor that will have you reaching for your sunnies as you open the box! Indeed, the Crescendos are not for the faint-hearted. These are for the days when you want to dress to kill and get maximum attention. Right now the fashion is to sparkle - and these will help you do just that in spades! 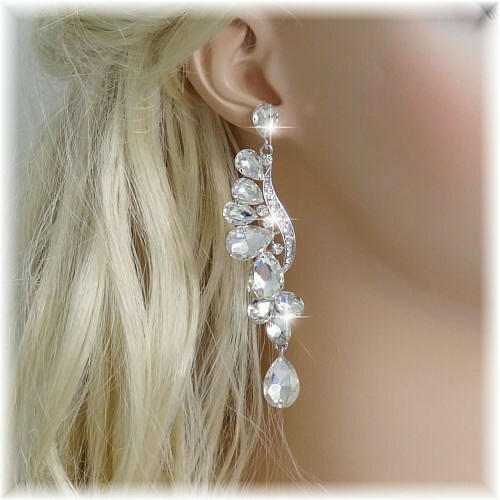 Created using ten vari-sized sun-cut crystal clear Austrian crystals, with a crystal-studded crescent at the side, they're lean and mean, with a substantial dangle of 8.7cm/3.5". However, although excellent in quality, happily you won't find your ear lobes on your shoulders after a night out, because the weight is just perfect. Ideal for weddings, proms, balls and dinner dates. Or when you just want to knock 'em dead at the office or barbecue! Length: 8.7cm/3.5" x 2.1cm/0.83" Silver Rhodium plating for strength and good looks.